In deep 12-inch skillet, heat oil over medium-high heat. Sprinkle chicken with salt and pepper. Add chicken pieces to skillet; cook 5 to 6 minutes, turning occasionally, until chicken is light golden brown. Remove chicken from skillet. Add onion, garlic, fennel and bell pepper to skillet. Cook 2 to 3 minutes, stirring constantly, until vegetables are crisp-tender. Add chicken, tomatoes, wine and rosemary; break up tomatoes. Heat to boiling. 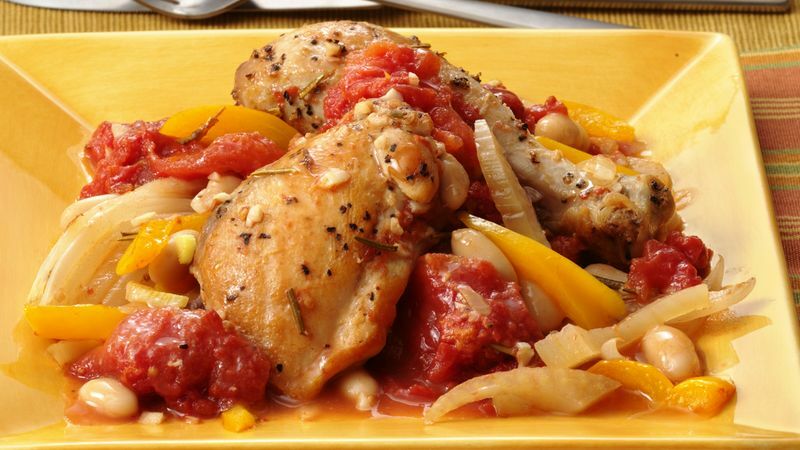 Reduce heat; cover and simmer 20 to 25 minutes, turning chicken once, until chicken is tender. Stir in beans. Cook uncovered about 5 minutes longer or until sauce is slightly thickened and juice of chicken is clear when thickest piece is cut to bone (170°F for breasts; 180°F for thighs and drumsticks). Serve in shallow bowls; sprinkle with parsley. Serve with crusty French or Italian bread. You'll need it to dip in the flavorful sauce!